10457 ft (3187 m) . Lassen Peak is the southernmost active volcano in the Cascade Range, located in northern California halfway between Lake Tahoe and the Oregon border. Prior to Mount Saint Helens in 1980, Lassen was the last volcano in the continental U.S. to erupt, with a major series of eruptions starting in 1914 and continuing sporadically until 1921. Lassen is one of the largest plug domes in the world, a massive block of dacite lava extruded up from the shattered remains of the collapsed Mount Tehama stratovolcano. Brokeoff Mountain and Mount Diller are the highest remnants of this formerly 11000 ft (3400 m) progenitor volcano, the bulk of which was eroded away by repeated glaciations during the past several hundred-thousand years. The active hydrothermal features of Sulphur Works and Bumpass Hell provide evidence that magma still underlies this area. Lassen Volcanic National Park receives some of the heaviest snowfalls in California during the winter and spring, with the snowpack often building 20-25 feet (6-8 m) deep near Lake Helen, just south of Lassen Peak. 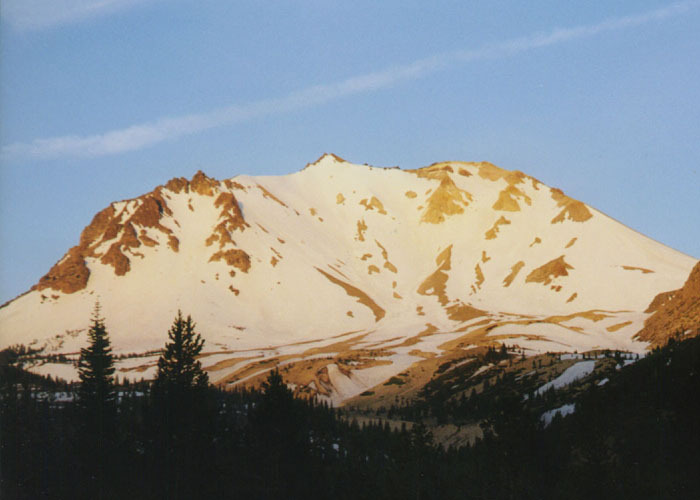 Despite this, Lassen's southern latitude and modest elevation prevent the formation of glaciers, with only a few small permanent snowfields lasting through the hot summers. However, the Lassen Park Road allows easy access to a variety of fine ski routes throughout winter, spring, and into early summer. The road is easily skied in winter, and as plowing of the road progresses in spring, the distance to the summit shortens significantly. 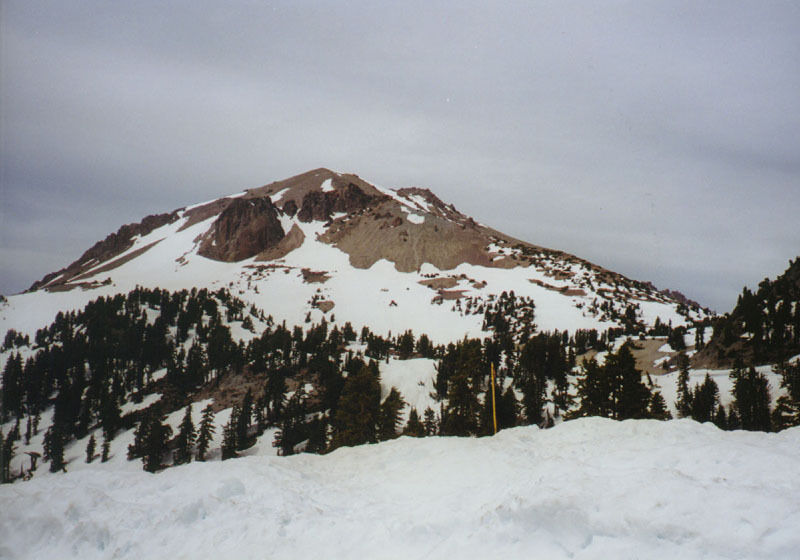 (5 km) This route follows the snowcovered hiking trail to the summit of Lassen Peak. In late spring and summer, when the park road is open to its 8500 ft high point, this is one of the shortest and easiest summit routes on any of the Cascade volcanoes. Several variations are skiable from the summit, to the southwest, south, and southeast. 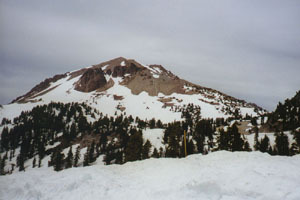 In winter, the lower portion of the route follows the road from Lassen Chalet, the former site of a small ski area near the southwest entrance of the the park. Using the Sulphur Works Cutoff trail shortens the road skiing by 2 miles. (14 km) These routes are two possible variations from the direct Northeast Face route. Both are considerably less steep, but somewhat longer and more circuitous. It is also possible to ski up these routes (especially the Southeast Face) all the way to the summit, allowing the interesting possibility of a loop trip by then descending via the steeper Northeast Face. 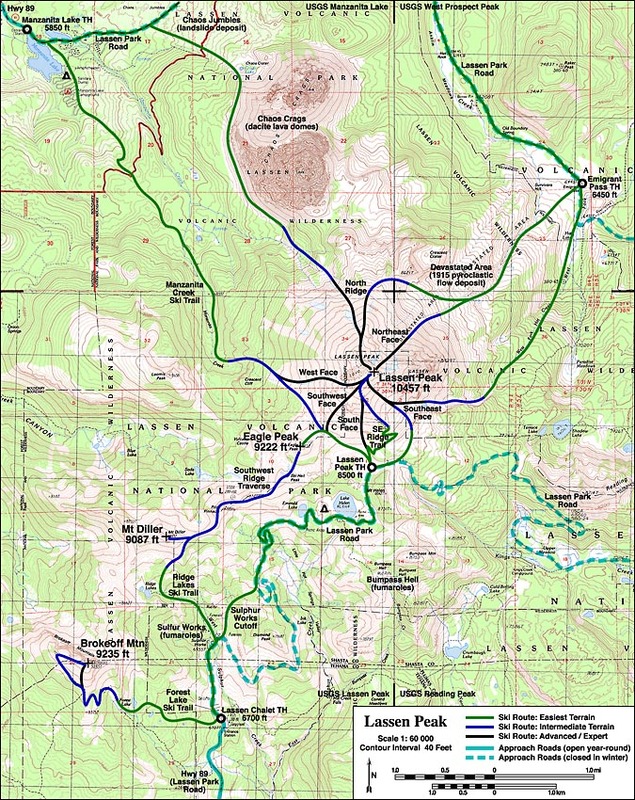 (24 km) Winter access to the northern side of Lassen Peak begins from the Manzanita Lake Entrance in the northwest corner of the park. The North Ridge can be reached by skiing the park road east to Chaos Jumbles, then turning southeast and traversing up along the west edge of Chaos Crags. Another route follows the Manzanita Creek Ski Trail southeast, starting from just past the entrance station. This leads to the headwaters of the creek just below Crescent Cliffs, which can be passed by gentler slopes to their north. The open west slope leads to the summit, while just southeast lies the Eagle Peak Saddle and the summit trail parking lot. 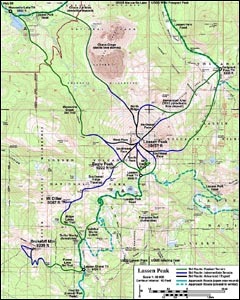 (22 km) Several traverse routes are regularly done across Lassen Park. It is easiest to start at the south end, since Lassen Chalet is 1000 ft higher than Manzanita Lake. After skiing up the road to the summit trail parking lot, the traverse can proceed directly over the summit and descend via either of the North Ridge or West Face. An easier traverse which avoids the summit passes though Eagle Peak Saddle into the Manzanita Creek drainage. (9 km) Brokeoff Mountain is the second highest summit in the park, with the sheer cliffs of its north side presenting a spectacularly rugged profile from the park road. Contrary to its name, the mountain did not form in a sudden collapse, but by the steady erosion of glaciers in the north side cirque, the same forces which leveled the rest of the Tehama stratovolcano over the ages. 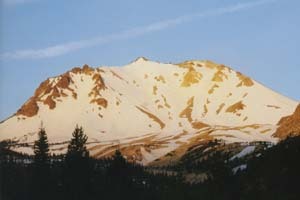 Despite the forbidding northern aspect, the southern slopes present a moderate ski ascent and descent with rapid access even throughout the winter from Lassen Chalet.